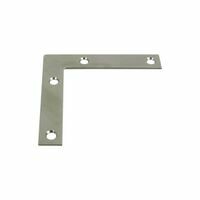 National Hardware Corner Brace, Series: 117BC3, 3/4 in Length, 1/2 in Width, 0.07 in Thickness, 2 Mounting Holes, 0.29 in Diameter X 82 deg Countersunk Mounting Hole, Steel, Zinc Plated, Includes: Screws, BHMA A138.18, For Chests, Screens, Windows and Furniture Designed for chests, screens, windows, furniture, etc. Used for reinforcing inside of right angle corner joints. Screw holes are countersunk. Use on wood in both the indoors and outdoors. Reinforces flat, right angle corner joints. Rust resistant. Designed for chests, screens, windows, furniture, etc. Used for reinforcing inside of right angle corner joints. Screw holes are countersunk. Designed for chests, screens, windows, furniture, etc. Used for reinforcing inside of right angle corner joints. Screw holes are countersunk. Designed for chests, screens, windows, furniture, etc. Used for reinforcing inside of right angle corner joints. Screw holes are countersunk. Designed for chests, screens, windows, furniture, etc. Used for reinforcing inside of right angle corner joints. Screw holes are countersunk. 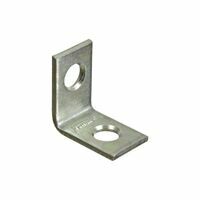 National Hardware Corner Brace, Flat, Series: 117BC3, 3-1/2 in Length, 5/8 in Width, 0.07 in Thickness, 0.24 in Diameter Mounting Hole, Steel, Zinc Plated, Includes: Screws, BHMA A138.18, For Chests, Screens and Windows Hole sizes fit Phillips flat screws sized #7. Drill a pilot hole with a 3/32" sized drill bit when using wood screws. Designed for chests, screens, windows, furniture, etc. Used for reinforcing inside of right angle corner joints. Screw holes are countersunk. Boxed loose barcoded. Designed for chests, screens, windows, furniture, etc. Used for reinforcing inside of right angle corner joints. Screw holes are countersunk. Designed for chest, screens, windows and furniture. Designed for reinforcing, attaching, connecting and splicing panels and other home and industrial applications. Product design allows for quick and easy repair of general household items. Screw holes are countersunk. Boxed loose barcoded. Designed for chest, screens, windows and furniture. Hole sizes fit Phillips flat screws sized #7. Drill a pilot hole with a 3/32" sized drill bit when using wood screws. Designed for chests, screens, windows, furniture, etc. Used for reinforcing inside of right angle corner joints. Screw holes are countersunk. Boxed loose barcoded. Used for reinforcing two miter joint pieces that create a 90 degree angle. Clearance for 5/16" bolt or 2 nails per side. 45 degree hole pattern for nails provides easy installation option. Black powder coat finish for improved weather resistance. Designed for reinforcing, attaching, connecting and splicing panels and other home and industrial applications. Product design allows for quick and easy repair of general household items. Screw holes are countersunk. Boxed loose barcoded. Reinforces right angle corner joints. Use both indoors and outdoors. Rust resistant. Use #8 flat head screws. Designed to join two pieces of wood together at 90 degree angles, such as on screens and frames. Screw holes are countersunk. Drill a pilot hole with a 3/32" sized drill bit when using wood screws. 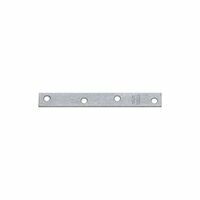 Stanley Corner Brace, Series: MP124BC, 2 in Length, Steel, Zinc Plated, BHMA A138.18 Designed for chest, screens, windows and furniture. Designed for reinforcing, attaching, connecting and splicing panels and other home and industrial applications. Product design allows for quick and easy repair of general household items. Screw holes are countersunk. Boxed loose barcoded. Designed for reinforcing, attaching, connecting and splicing panels and other home and industrial applications. Without screws, boxed loose. Reinforces right angle corner joints. Use both indoors and outdoors. Rust resistant. Designed for chests, screens, windows, furniture, etc. Used for reinforcing inside of right angle corner joints. Screw holes are countersunk.